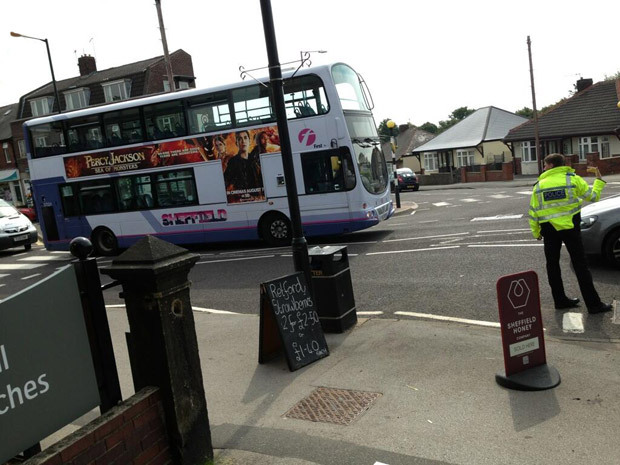 A broken down 51 bus caused minor delays to traffic in Crosspool shopping precinct this morning at around 11am. The stationary 51 bus blocked Sandygate Road over the zebra crossing near Artisan restaurant, meaning there was only room for vehicles to pass in a single direction at any one time. Police were on hand around to direct traffic around the bus until it was repaired later in the morning. This entry was posted in crosspool, photos, police, transport and tagged 51 bus, broken down, crosspool, sandygate road. Bookmark the permalink.